A UC Davis fire crew and a veterinary team spent the long weekend hard at work at the Camp Fire, while back on campus, other firefighters ran a relief effort for the fire victims, and veterinary staff tended to animals brought in from the fire zone. The School of Veterinary Medicine reported taking in cats, pigs, goats, a donkey and koi — the second time in just over a year the campus has taken in koi from fire zones. The organizers, from left: Kyle Dubs, Corrie Beall and Paul Rush. Rush and firefighters Corrie Beall and Kyle Dubs launched the drive the next day, Nov. 9, asking for new and gently used goods. The collection — now limited to new items only — continues until 7 p.m. Wednesday (Nov. 14) at the firehouse on Kleiber Hall Drive off Hutchison Drive. The Fire Department has set up a website with all the details, including a list of current needs. No sooner had the collection begun, when the campus cleared out for the three-day Veterans Day holiday weekend. But the contributions came anyway, as people learned about the drive through social media. “The response from the UC Davis, Davis and Bay Area communities has been humbling and heartwarming,” said Rush, speaking on behalf of himself and the other co-organizers. Martin Vega Martinez and Lily Trauernicht load trailer. Fire Chief Nate Trauernicht delivered the first load of goods on Sunday (Nov. 11) — a trailer and a pickup full of boxes stuffed with supplies — with help from his daughter Lily and a student firefighter, Martin Vega-Martinez. The chief made a second run Monday (Nov. 12). Since then, the Fire Department has secured two 16-foot box trucks from Fleet Services. “At this time we have received, sorted and packed almost 200 boxes worth of donations — in two days,” Rush said. Some of the most needed new items are personal hygiene items (men’s and women’s), undergarments, bedding, toys and children’s books, and single-serving, nonperishable foods. The Aggie Compass Basic Needs Center had planned a collection this week of gently used professional clothing to give to students in need, but has called it off and instead will serve as a drop-off point for the Fire Department collection for the Camp Fire, until 5 p.m. Wednesday (Nov. 14). Aggie Compass is on the first floor of the Memorial Union’s East Wing). Professor Madigan and one of the piglets. Officials called in UC Davis’ Veterinary Emergency Response Team on Saturday (Nov. 10). Three veterinarians — VERT Director John Madigan, Emily Berryhill and Lais Costa, and five veterinary students — quickly reported to the Butte County Fairgrounds in Gridley and went to work helping dogs, horses, pigs and goats, among other animals. VERT has been at the fairgrounds every day since with a rotating group of veterinarians and students. Saturday evening, the team returned to campus with a pair of piglets; one succumbed to burns, while the other “is doing OK, up and active,” said Trina Wood, communications officer for the School of Veterinary Medicine and its Veterinary Medical Teaching Hospital. Sunday at the fairgrounds saw the arrival of goats, a horse and donkey found together. The donkey collapsed, so it was loaded into a trailer and hauled to the Veterinary Medical Teaching Hospital. “He didn’t appear to have any burns or major injuries,” Wood said, “but advanced age and arthritis may have played a part in his collapse. Aleman dubbed him “Pancho,” and “he was settling in his new digs for the night and enjoying a snack and fresh water,” Wood reported. 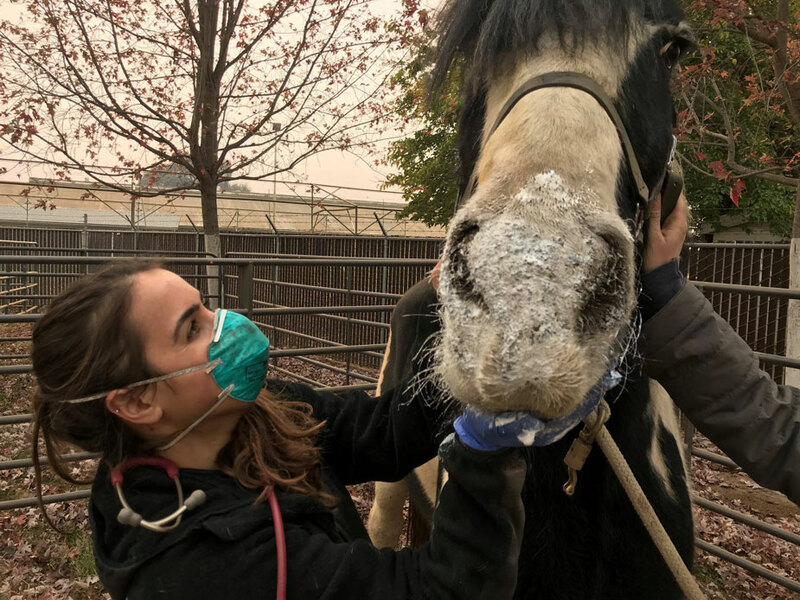 Veterinary student Ashley Nola tends to horse injured in the Camp Fire. Monday night, nearly two dozen cats arrived at the Veterinary Medical Teaching Hospital's Small Animal Clinic for treatment of burns — primarily to paws but also to other parts of the cats’ bodies, including face and ears. Today the communications team launched a Facebook album of the unclaimed cats — an outreach effort meant to reach the owners. VERT’s fish-saving mission began Sunday night when Madigan, distinguished professor of veterinary medicine, received a call from someone seeking advice on saving koi and fancy goldfish. “He gave them step-by-step instructions and didn’t hear anything more until this morning (Monday) when they called back — they had all the fish in a holding tank in a truck and were on their way to Davis,” Wood said. Madigan coordinated with Linda Deanovic, director of the Center for Aquatic Biology and Aquaculture, and she mobilized staff to come prepare two holding tanks. Wood said the fish belong to Paradise Town Councilman Scott Lotter and his wife, Tracy. Read about UC Davis’ involvement in saving 30 koi from the wine country wildfires a year ago. This year’s rescue brought two koi and approximately two dozen goldfish to UC Davis. Madigan and four students helped unload the fish into their new home, then returned to the Butte County Fairgrounds for another day of work. The School of Veterinary Medicine is posting updates here.